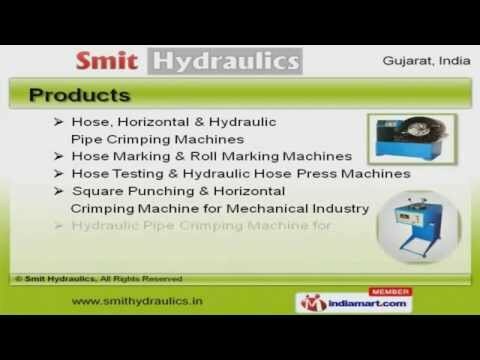 Welcome to Smit Hydraulics, Manufacturer and Exporter of Hydraulic Machines. The company was established in 2002 at Ahmedabad. We export to Dubai, Australia, South Africa and Middle East. Hardik Engineering and Jagdish Engineering Works are some of our esteemed clients and we are backed by Industry leading prices and Easy payment modes. We offer a vast range of Hose, Horizontal and Hydraulic Pipe Crimping Machines. Our Hose, Horizontal and Hydraulic Pipe Crimping Machines are best in the industry amongst others. We offer Hose Marking and Roll Marking Machines that are acknowledged for their functionality. Hose Testing and Hydraulic Hose Press Machines offered by us are superior in performance. We offer Square Punching and Horizontal Crimping Machine for Mechanical Industry that are extremely reliable. Our Hydraulic Pipe Crimping Machine for Pipe Fitting and Hose Testing Machine for Automobile Industry are a class apart.